In marshes around the Saginaw Bay, you may notice a white bird standing motionless. The brightest white you can imagine covers the four-foot-tall body of a Great Egret, a relative of the Great Blue Heron. With spindly black legs and bright yellow bill, it stalks prey by standing, waiting, and peering into the water. Its patience is remarkable, but if nothing appears, the egret walks slowly to force prey to move. When an egret catches a fish in its dagger-like bill, it swallows the fish headfirst. Its carnivorous diet includes crayfish, dragonfly and damselfly nymphs, whirligig beetles, and giant water bugs. 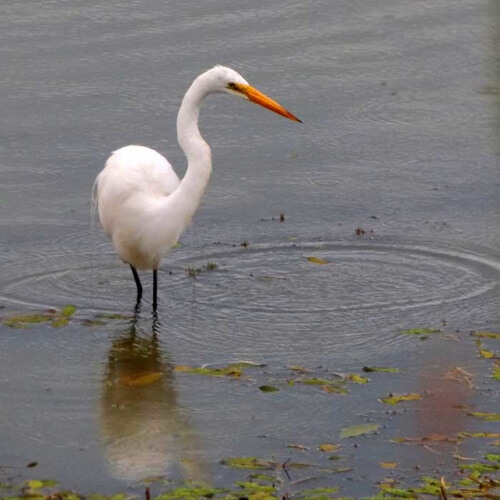 In wet meadows, an egret hunts snakes, lizards, frogs, and occasionally small mammals. Great Egrets arrive in April to establish colonies on forested islands or swamps adjacent to the Great Lakes. The first record of nesting egrets in Michigan was in 1954. In 2009, over 500 pairs were counted in the last colonial waterbird census. Colonies may vary from a few occupied nests to almost 100, often sharing the site with Great Blue Herons or Double-crested Cormorants. They build platform nests made of sticks high in the treetops. Established colonies occur in the Saginaw Bay on Little Charity Island and the Confined Disposal Facility Island. Older colonies exist on islands in the Detroit River and Pointe Mouillee State Game Area. During courtship, long plumes known as “aigrettes” grow from their shoulders and extend beyond the tail. Plumes stand up during courtship displays at the nest site. Bare parts become more vibrantly-colored: the bill turns bright orange-yellow and the skin at the base of the bill changes to bright lime green. Once incubation begins, these colors fade to yellow and the plumes reduce in length and number. Both sexes look alike. Three to four eggs are incubated over 26 days by both parents. Chicks hatch asynchronously and parents take turns feeding regurgitated food to the young. Older chicks may peck on or steal food from younger siblings. Those that survive will fledge at 51 days, ready to face the world on their own. In August, juvenile Great Egrets disperse from their natal site to many wetlands around the region. You may see congregations of five to 30 birds foraging during the day or roosting in trees at night. Get outside to spot these white beauties before they migrate south. Overhunting almost decimated the populations in the early 1900s when plume hunters killed egrets of many species for the millinery trade to adorn ladies hats. Protection by the federal Migratory Bird Act in 1918, along with the Clean Air Act and Clean Water Act in the 1970s, helped populations rebound. 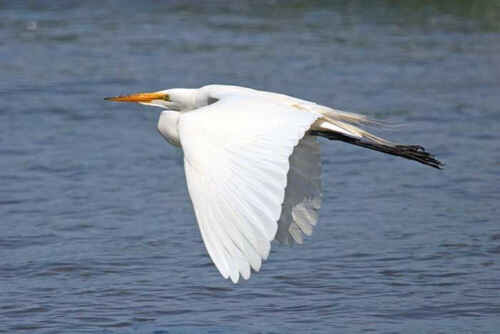 The National Audubon Society, established in 1905, adopted the Great Egret as its symbol to represent conservation efforts on behalf of birds and their environments throughout the United States. Threats to continued survival include destruction of wetlands and nest trees by development: water pollution, dumping of trash, and tires and vehicles along shorelines. Egrets face predators such as raccoons and snakes that steal eggs and owls that prey on youngsters in nests. 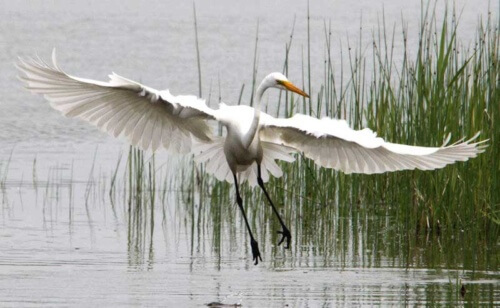 Egrets that visit aquaculture ponds or fish hatcheries are in danger of getting shot or harassed.